So I have been working crazy hours for the past couple of weeks – really no time at all for knitting. It’s been really hard because the knitting helps me to destress! *sigh* Ah well, I know that things will lighten up at some point… it’s just difficult to be patient sometimes! 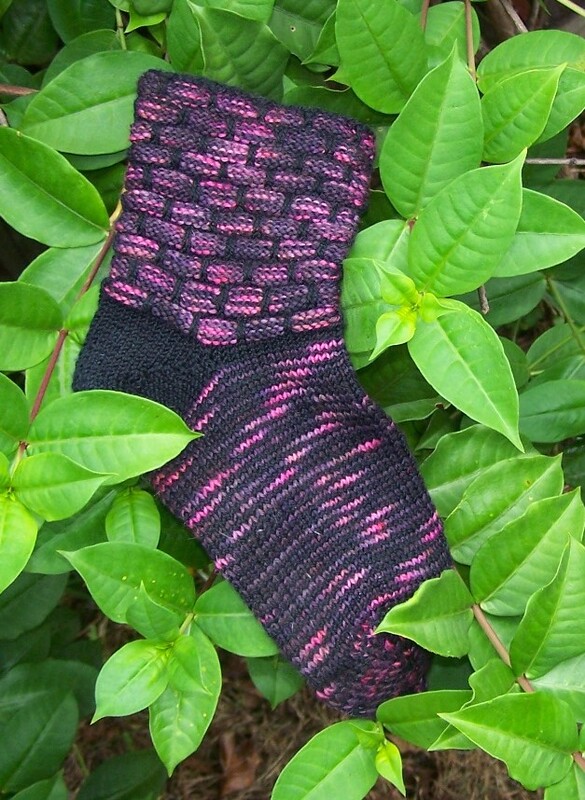 I’ve created the pattern as a PDF, finding that so much easier than rewriting the entire thing here, so here you go: Ballband Socks! Please, give a shout if you run into any trouble with the pattern! On the running front – things haven’t been so good since my last running post. My shin stiffened up something terrible for several days, so I forced myself to rest. A couple of days ago, I got back out there and ran a very slow 3 miles, though. It was a little later than I normally go, so I was able to run on the Pinellas Trail. And who did I run into? Woo Hoo, it was flip-flop man! I was heading home, but I turned & ran with him for a short while to get a quick update on how he was doing. As of Wednesday, he had logged 268 miles for the month of August. That is in 12 days, folks, just in case you were wondering. In flip-flops, not running shoes. :D He is my hero! Not a whole lot on the Dane front lately… though Leonardo did express his unhappiness with me over the long hours I’ve been working. He chewed up one of my lesser favorite movies. Still very upsetting because it is a relatively harder one to find – some day I’d like to get it on DVD, but the last time I found one, the seller was asking $150.00 for it!! Unreal. This entry was posted in Knitting and tagged Free Patterns, Great Danes, Knitting, Running. Bookmark the permalink. 8 Responses to Ballband socks! T-t-t-t-two hundred and s-s-s-ixty eight miles?!?!?!?! Do you know how many months it takes us normal people to run that distance? Does flip-flop man change his shoes every 400 miles or does he let them flop? love that stitch pattern! just used it on a pair of gloves—it does make a great cuff. I don’t think I run that much n my whole life, for god sake.